Global equity markets pushed higher, but did give back most of their gains to end the week. The midterm elections, which dominated investor sentiment throughout the week, concluded Tuesday. The S&P 500 Index recorded another week of gains, up 2.2%, as ten of the eleven underlying sectors turned in positive results. Stocks recorded modest gains on Monday and Tuesday, as polls suggested that Democrats would take the House and that Republicans would retain control of the Senate. Stocks surged on Wednesday after those results were confirmed, with the S&P 500 recording its third-best daily gain over the past year. In the end, large cap stocks outperformed small cap while value bested value across the market capitalization spectrum. Healthcare, real estate and utilities stocks led the way, while communication services, energy and technology stocks lagged. Communication services stocks performed worst, held down by late declines in Netflix and video game stocks. 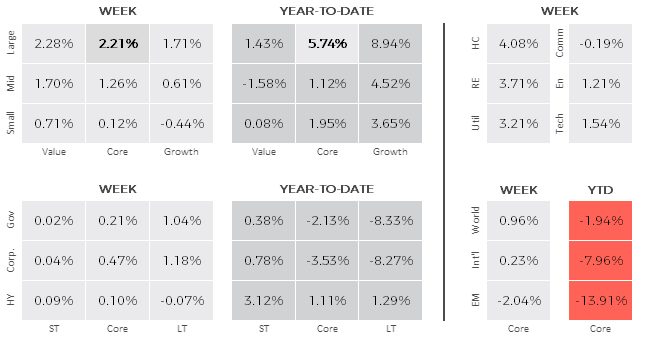 Developed non-U.S. markets, as measured by the MSCI EAFE Index, increased a meager 0.2%. European markets remained under solid pressure after the EU warned Italy that it is poised to breach the EU’s 3% budget deficit limit in 2020 if the government proceeds with its current spending plans. Emerging markets, as measured by the MSCI Emerging Markets Index, turned in the worst relative results with a 2.0% decline. Weakness was widespread, despite China reporting a surprisingly large increase in October exports, underscoring strong global demand for the country’s goods amid a backdrop headlined by U.S. tariffs. Chinese exports climbed 15.6% in dollar terms in October from a year ago, above September’s 14.5% advance and economists’ 11% forecast. The yield on the benchmark 10-year Treasury decreased from 3.22% at the end of trading the previous week to 3.18% at the close Friday. The decrease in yields pushed bond prices higher, especially for longer-term Treasuries that are particularly sensitive to interest rate changes. Credit markets struggled amid a sharp decline in oil prices. The earnings season is winding down with only 12 companies in the S&P 500 reporting earnings over the next week. The estimated Q3 earnings growth rate is 25.2%, its highest result in 8 years.